I came to CT DDS Families First after twenty-one years of PPTs, IEPs, four failed group home placements (public and private) resulting in injury and negligent infection management to my son. I’ve learned that the only way to IMPROVE the situation for our loved ones and other families traveling this road, is for parents (who are more powerful than we realize) to do something. Fact is, when caring for a child with ID, trying to maintain a marriage, keep your living environment in order, make a living, running to PPTs for the first 18-21 years, going to doctor’s appointments that average three per month (sometimes taking you out-of-state for years), and breathing….you just do not have the energy or time to get involved. My son is now twenty-five and diagnosed with profound ID, Cerebral Palsy, Spina Bifida Occulta, is quadriplegic, non-verbal, has GERD, a G-tube, respiratory issues, dysphagia, a neurogenic bladder & bowel, a Cecostomy tube, he must be urinary catheterized every 4 hours, and have a cesostomy irrigation at least 5 evenings per week. While his medical needs deem him, “medically fragile”, I care for him at home with the help of in-home support staff. Yes that’s right; we have an ICF happening in our apartment! We had 4 failed skilled nursing group home placements. To be fair, I’m sure that there are great group homes out there, but we tried four times, none of them were with the same provider. I can no longer sit in the bleachers because I know that my son and I are not the only ones who have experienced disappointment and/or disgust with group home care. When I think of even one mother and child having to go through the trauma that we went through….I have to stand up and bring these matters to the attention of the persons who can do something about this….the CT General Assembly. I was born in CT and I care about my state, my community, and especially the IDD families who daily awaken wondering what will happen to their loved one. They close their eyes often wondering….what will happen to my child when I am gone? This uncertainty gnaws at your heart and your brain daily. Rather than give into the anxiety and depression that visit me with this question, I chose to stand up and join CT DDS Families First. 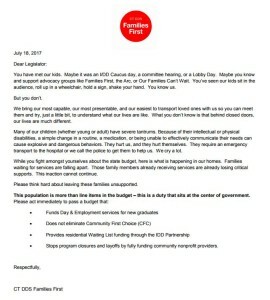 If more parents (regardless of whether your child is at home, in a group home, ICF, Regional Center, CCH or apartment) would stand up – if we all stood together, not for any single provider but for our kids and their lives; and worked together with the legislature…people would have to listen. Sure you want to and can support the provider that cares for your child. However, the time has come for us to take responsibility for the way in which the intellectually disabled are serviced in our state of CT. The providers are lobbying for their interests and will use families to further their agenda. We families have common challenges, common problems…none of us are the only one going through the isolation, the failed marriage, the draining of bank accounts, the lack of placement opportunities, the need for someone to talk to that understands, the need to have intelligent compassion that is able to take the mess apart and rebuild something that addresses the majority of need. DDS is our agency and it is our responsibility to make it as good as we want it to be. Which means that you, too, must get out of the bleachers…this is not a spectator sport. DDS Families First is not selfish (not looking for personal gain), not looking to lift themselves up (ego driven), and we are not living in a fantasy world – we acknowledge who and where our children are and we love them. We are not out to make individuals fit certain profiles. If your loved one is able to secure employment; great! If they are able to live on their own in the community; great! Just bear in mind that the window of time that is productive may come to an end – as we know, there are certain diagnoses that lead to the early onset of debilitating diseases that result in total dependence and a “smart apartment” will not be an appropriate living condition. We must look at the things that we have in common and develop a plan that will serve the greater population. I do not believe that the largest percentage of individuals served by DDS is going to or able to have lucrative employment or be able to live their lives out in a smart apartment; certainly those that can should. However, not at the expense of those who cannot. And those that cannot are the majority of the 17,000 individuals serviced by the department presently. If this makes sense to you…come and join us in making CT’s DDS, the best it can be! 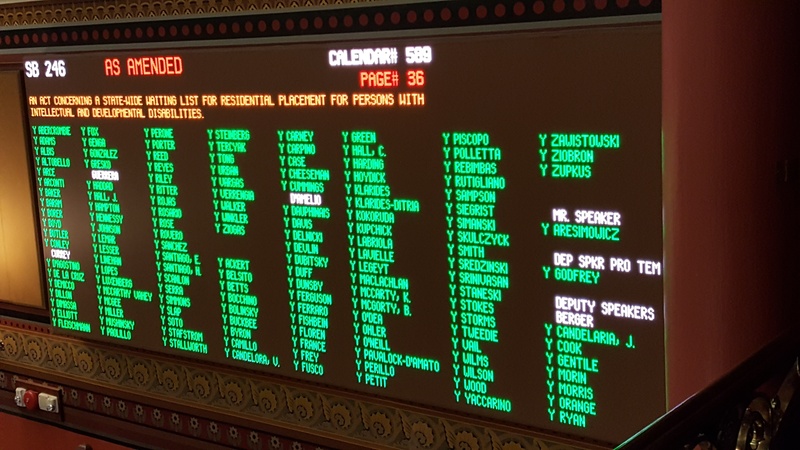 The Connecticut General Assembly supported the work of Families First by unanimously passing SB 246 in 2017, which Governor Malloy signed into law – Public Act No. 17-61. This legislation requires DDS to do a complete and annual census of the DDS clients who are on the residential waiting list. 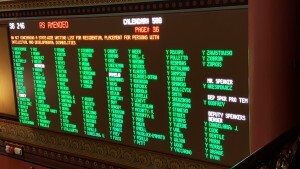 Legislators will now have accurate information when making budget decisions. Families First thanks the DDS commissioner for meeting with members of our leadership throughout the planning phase. Who Will Care for Katie? 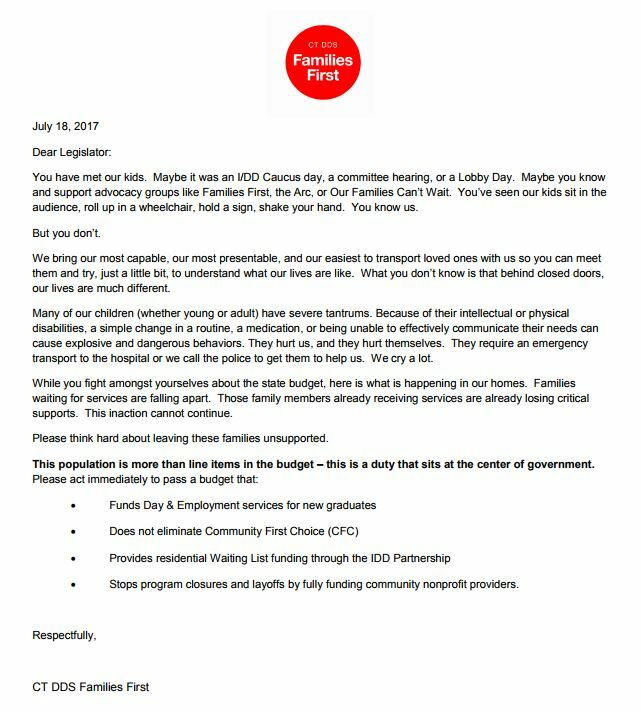 For too many years the CT budget has been balanced on the backs of those with intellectual and developmental disabilities (I/DD). 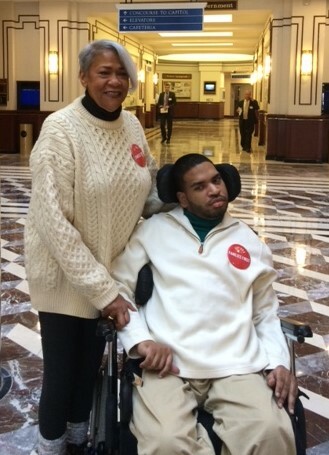 The Department of Developmental Services (DDS) has suffered a total of fifty million dollars in cuts since 2012. There are over 2,000 individuals on the DDS residential waiting list and 100 individuals on the new day services waiting list. Individuals currently receiving services from the DDS will likely see the erosion of those services due to the governor’s five percent rescission authority. It is time for the CT General Assembly to prioritize this population. Please join your fellow DDS families in this family advocacy effort and share the information through your SEPTAs, Special Olympics’ teams, etc. There are approximately 20,000 DDS families. Together we must be the voice for those with I/DD.